Able to regenerate endogenous antioxidants. Indicated for protecting the body following cerebral ischaemia, brain or nerve tissue damage . - It's active in aqueous and lipid regions (it's both water-soluble and fat-soluble). - It recycles vitamin C, vitamin E, Coenzyme Q10 and Glutathione after their use by the body and therefore significantly increases their effectiveness. - It is rapidly converted to its metabolite dihydrolipoic acid in most tissues and in this form, protects against free radicals. In fact, alpha lipoic acid is unique in neutralising around six types of particularly damaging free radicals. It's also a chelator of several toxic metals. It's used preventatively and therapeutically in a number of diseases, in particular, the complications of diabetes. 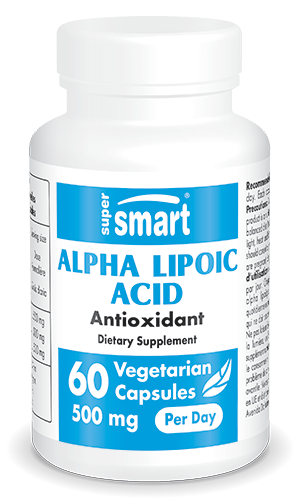 Each vegetarian capsule contains 250 mg of alpha-lipoic acid. Take one or two capsules a day. Therapists often recommend 3-6 capsules a day.